The Best Two Weeks of Your Summer! Camp Aiding is the best of both worlds. 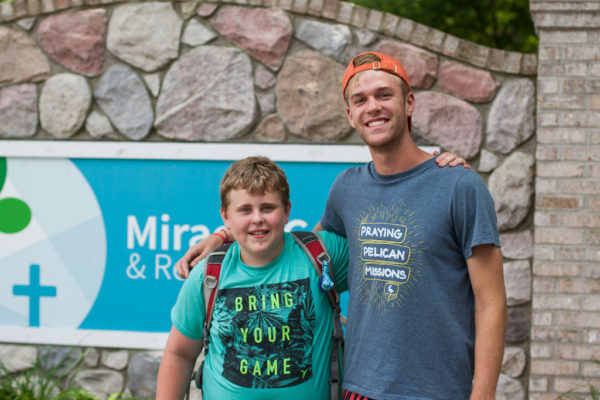 As a Camp Aide, you have the incredible opportunity to be partnered with a counselor and assistant counselor to gain an inside look at what goes into being a part of Miracle Camp’s summer staff team. Camp Aiding has greatly impacted my walk with Jesus Christ and I am so thankful for the opportunities and lessons I have learned through being a Camp Aide. Camp Aide’s have a truly unique position for the two weeks they are serving at Miracle Camp. Each is assigned a specific cabin with campers who will learn together, have fun together, and experience Christ in many ways, especially through two chapel sessions every day and cabin devotions. When Camp Aides are not with their assigned cabin, they are out doing things like personal devotions, group devotions, and camp maintenance (which let me tell you, is much more fun than it sounds). It’s awesome to form deep, Christ-centered relationships with other Camp Aides who share the same hope and purpose; to proclaim the Gospel. Camp Aides are constantly being pushed into a deeper understanding of Jesus Christ. Trying to narrow down my favorite part of Camp Aiding is extremely difficult because almost everything could be my favorite. One thing I really loved about Camp Aiding, though, is realizing different parts of who I am that I didn’t know beforehand by being encouraged and pushed to step outside my comfort zone. Being pushed out of your comfort zone is difficult, but I believe it is important part in understanding what Jesus wants to teach you. Camp Aides also get the experience of late night staff worship, which is incredible because it allows you to take the focus off yourself and respond to all that Christ is. All of these opportunities not only result in amazing relationships made with people at camp but also with an increased love for your own personal relationship with Christ. Camp Aiding will challenge you mentally, physically, and most importantly spiritually. It will impact you in a way that makes you want to tell someone because you can not keep the joy of Christ inside. The greatest spiritual impact on me, through Camp Aiding, has been through personal devotions. Spending time in one part of scripture really quiets your mind and allows the Word of God to impact you. Getting to discuss what Christ is doing in the lives of other Camp Aides inspires me to grow as well. These discussions strengthen the relationships between other Camp Aides and shows how God speaks differently to people. Most importantly, as I touched on above, I am so thankful for how being a Camp Aide has impacted me in my own life by pushing me out of my comfort zone. I’ve been able to see that there is a bigger picture, that our God is constantly active, and that there is nowhere better to be than to be experiencing Jesus Christ as our Lord and Savior. Being surrounded by Christ followers, and Jesus, for two weeks will leave you wanting more, and will set a fire inside your soul to experience and tell others about what Christ is doing in your life. Camp Aiding has impacted my life for the long run and I am so thankful for all the opportunities, lessons, relationships, and applications being a Camp Aide has taught me over the years. If you are going to do one thing this summer, consider applying to Camp Aide at Miracle Camp. It will not disappoint. Watch this video to see a glimpse of what Camp Aiding is like!